First, a quick primer about religion in Japan. Most Japanese practice both Shintoism and Buddhism. 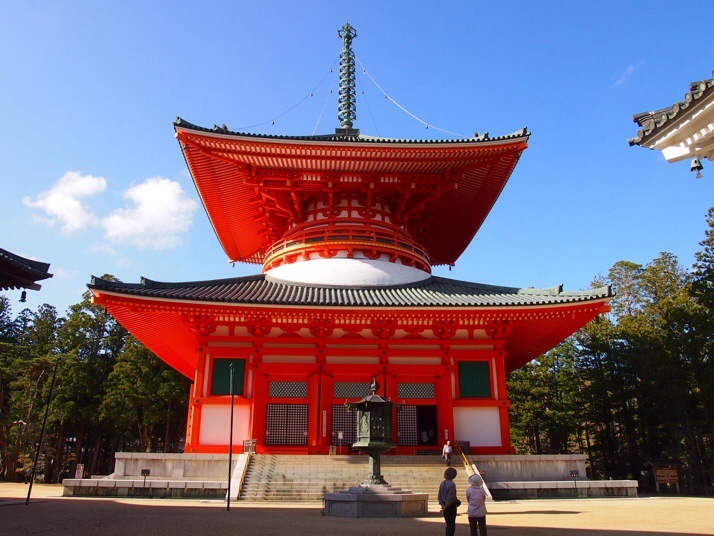 Shintoism is the native religion and celebrates life, the many shrines are dedicated to various gods of the natural world, for example, the god of rain, or the god of the mountain. When babies are born they are celebrated at the Shinto shrine, and its also where farmers make offerings and prayers for a good crop or favourable growing weather. Buddhism, which arrived via China and Korea, is practiced alongside, and has many rituals relating to death so funerals are conducted at the Buddhist temple. Therefore it is said that Japanese are born under Shintoism and die under Buddhism. 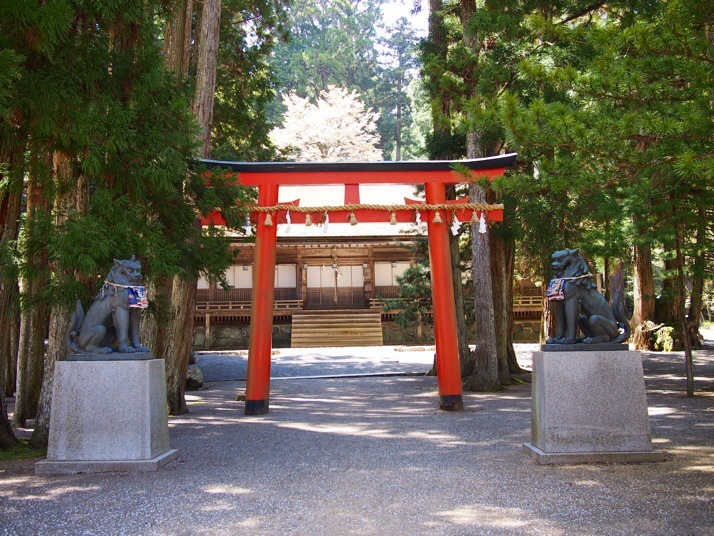 However, the two religions are so entwined that it’s sometimes difficult to know where one ends and the other begins, Shinto symbols such as torii gates or shrines are often found at Buddhist temples and vice versa. Koyasan is a sacred place for Buddhism in Japan and the home of the Shingon school of Esoteric Buddhism. 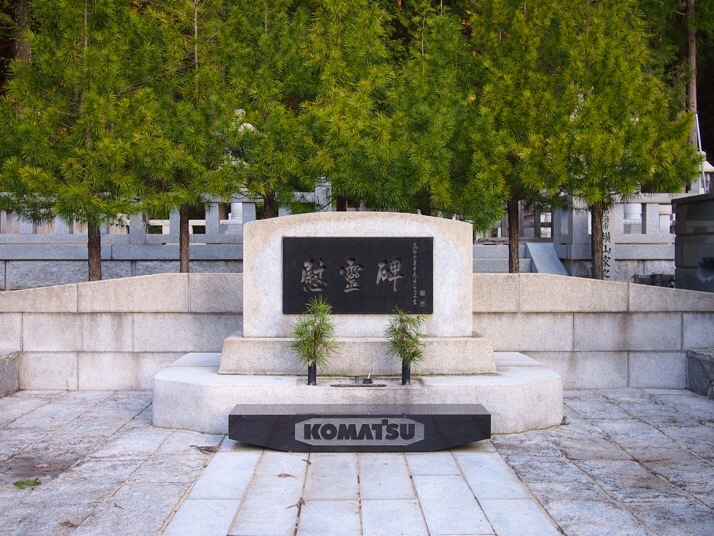 Its founder, Kobo Daishi, established a religious community here in 816 AD and is buried here, or rather his followers believe that he has entered a state of meditation in his tomb to await the arrival of the future Buddha. 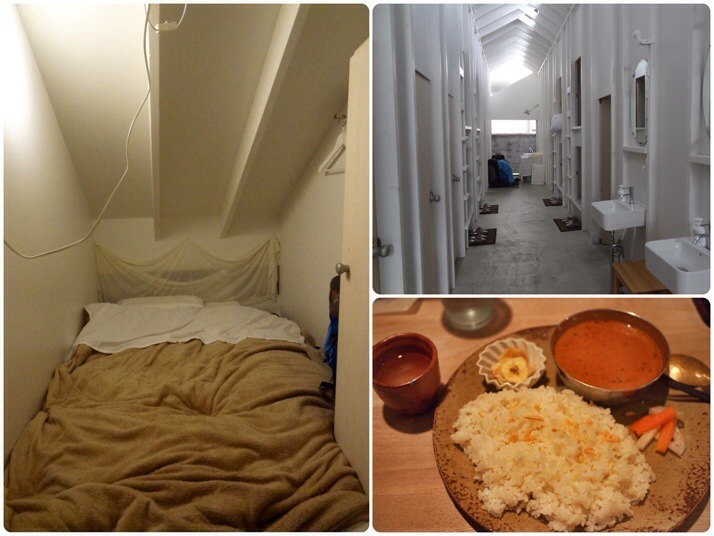 Many visitors stay in one of the 50-60 temples around the town and we considered doing that, but it’s fairly expensive (prices start at £60 per person per night half board) and so we chose the budget alternative – a capsule guesthouse! Koyasan Guesthouse Kokuu is small and perfectly formed, it’s run by husband and wife team Ryochi and Yuri, and when we arrived Ryochi sat down with us and a map for about 10 minutes managing to answer all of our many questions without us having to actually ask them! Our capsule bedrooms were surprisingly spacious and very comfortable, and Yuri cooks up a mean curry which we enjoyed for our dinner with a flask of hot sake. Some of the things we wanted to experience which are typically included as part of the temple-stay experience were the opportunity to witness the monks’ chanting in the morning ceremony, the chance to learn more about the religion and monks’ lives, and trying the Buddhist vegetarian cuisine called Shojin Ryori. 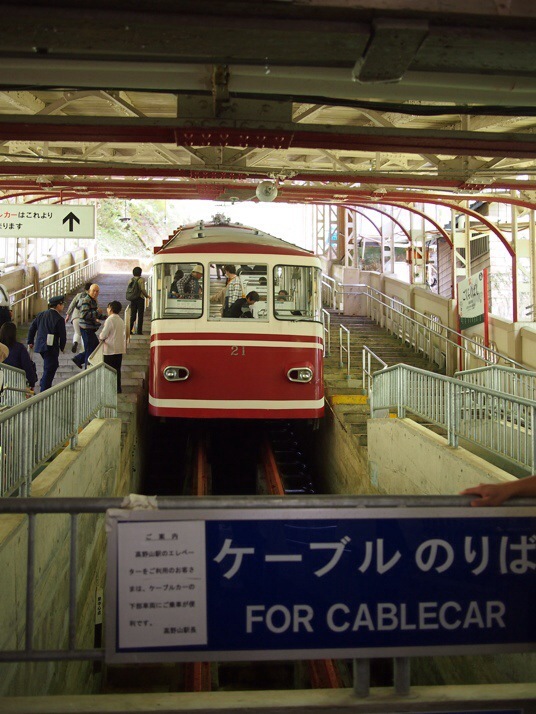 Ryochi managed to construct an itinerary for us that covered all of those bases as well as seeing the main sights. First up was lunch at Sanbo where we tried a couple of the Shojin Ryori set menus. It was a diverse and interesting feast with lots of different kinds of tofu, delicious mountain vegetables, and lots of sesame seeds. Yum. 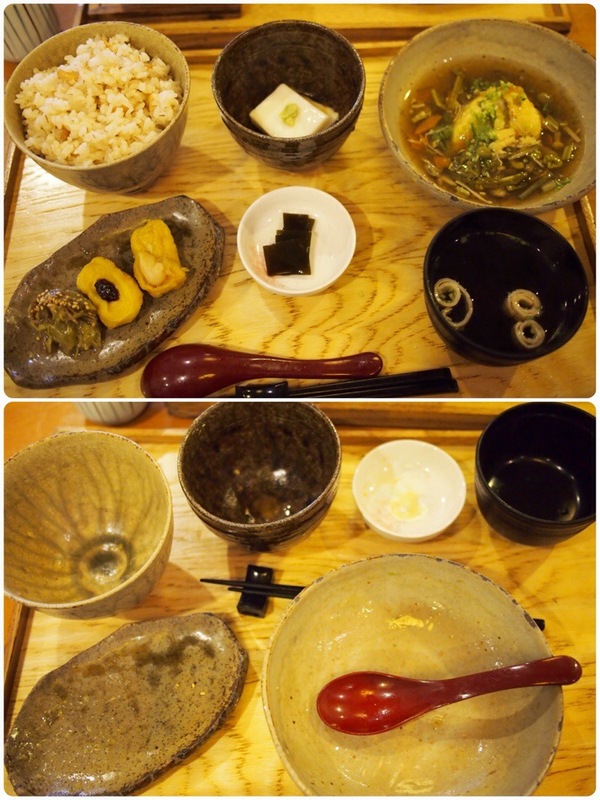 Shojin Ryori meal, before and after! Next we set off to visit Kongobu-ji Temple, the administrative headquarters of Koyasan Shingon Buddhism. Set around the entrance courtyard are the beautiful main hall with its thatched roof (complete with fire buckets on top), a smaller thatched building previously used to store documents and a belfry with an unusual outward curving wall described on the information board as a ‘skirt’. 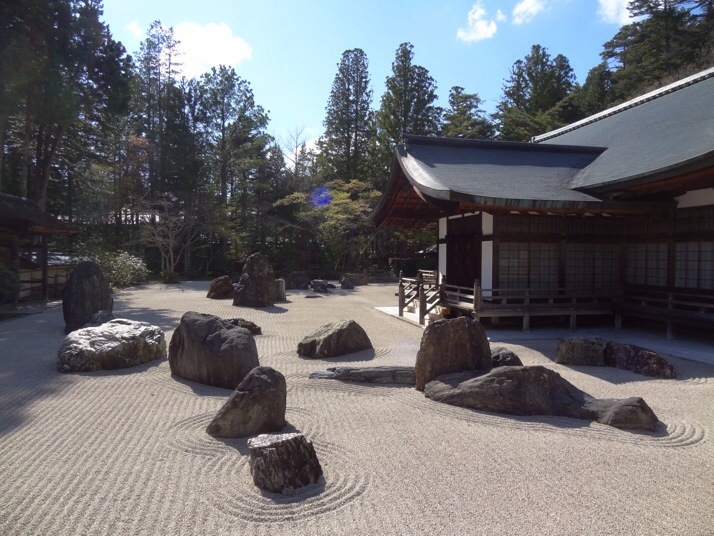 One reason that we visited was that this temple has the largest Zen rock garden in Japan. We found the rock garden a little disappointing as it wasn’t possible to see all of it and there wasn’t room to sit and contemplate around its edge. The leaflet explained that it represented two dragons flying through the clouds, but some idea of the meaning behind the forms would have been good too. However, the stunning painted screen doors dating from the 16th century which are in the rest of the temple more than made up for the slight disappointment of the rock garden. 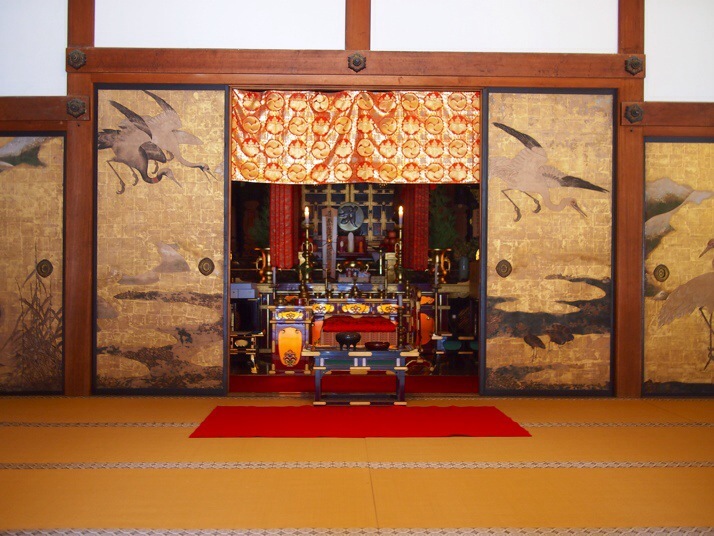 Amongst other things, they show scenes from Kobo Daishi’s life as well as flowers and birds of the four seasons. 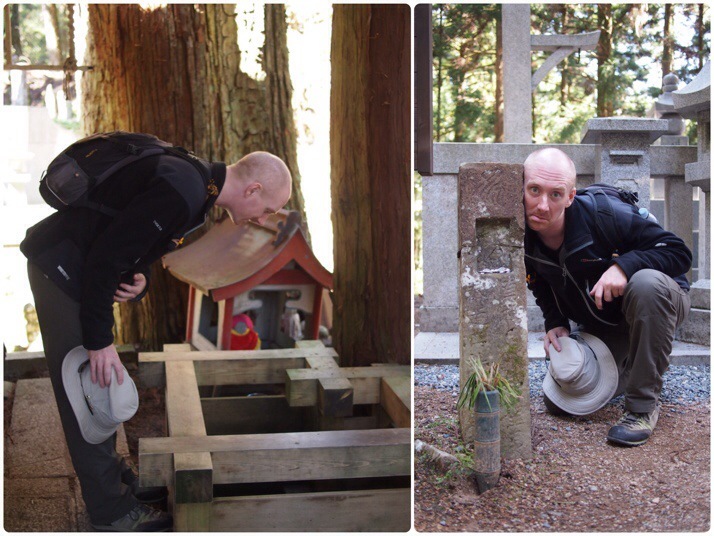 I didn’t quite know what to expect when we read all the superlatives applied to Okunoin Cemetery, but it really is as atmospheric as all the reviews suggest. I think I would even say that it’s one of my favourite places of the trip so far, certainly from a photography point of view. Two of the most obvious and useful things that he explained were the gorinto shape of most of the gravestones and the significance of the jizo statues. The gorinto is a column of five shapes representing (from bottom to top) earth, water, fire, wind, and space or void. Together with consciousness these elements form the whole universe. 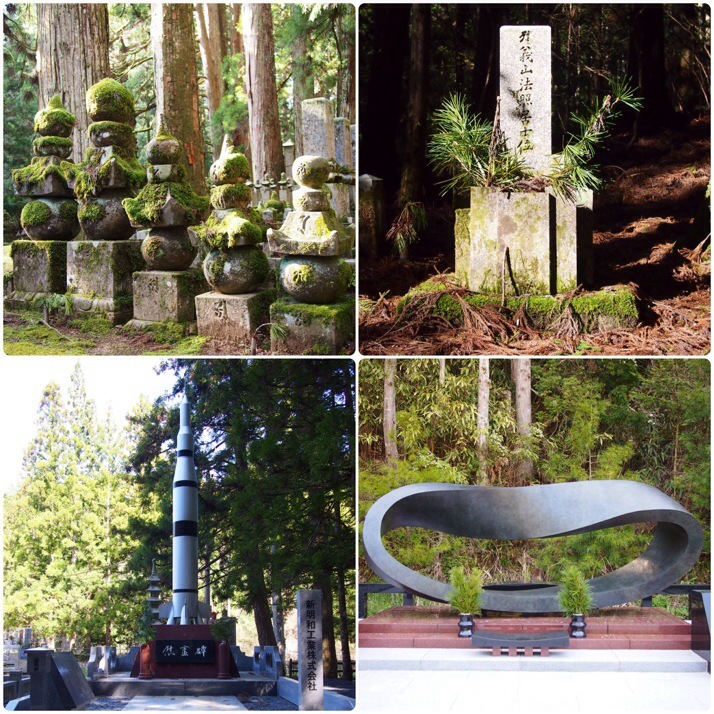 Gravestones – mostly gorintos but we saw many different ones including a space rocket and a Möbius strip! 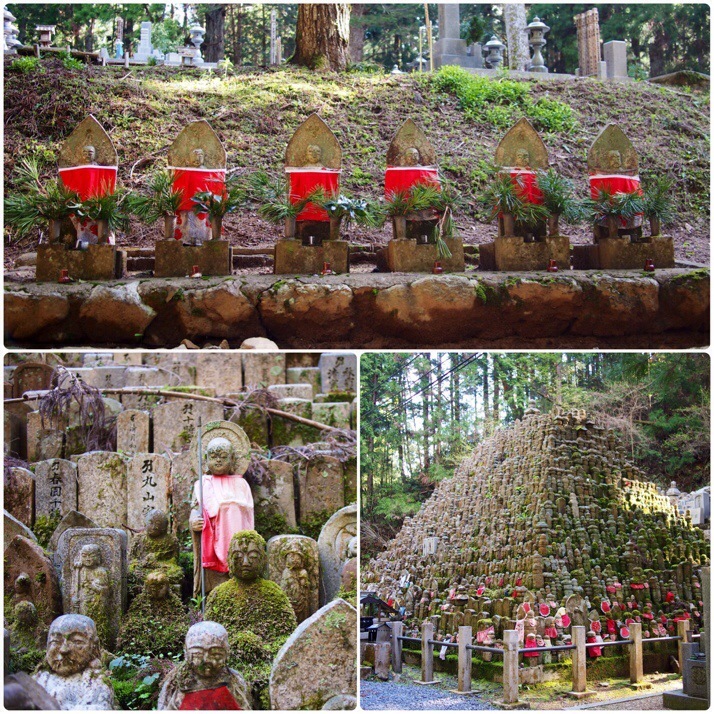 The small statues with bibs are jizo, they sit between the living and dead worlds, and their purpose is to guide spirits from life to death. They are often found at the site of deaths (e.g. by a roadside or forest trail). The bib should be red, it signifies the fire required to purify the spirit before crossing to death. 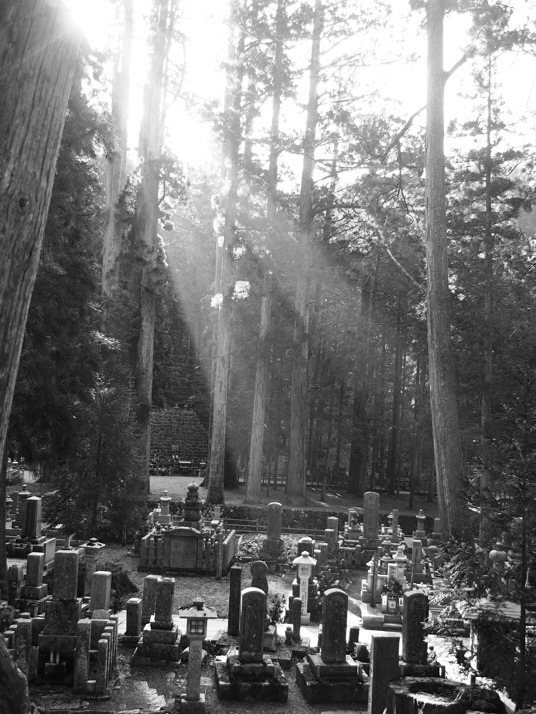 The mausoleum of Kobo Daishi is the most sacred place in the cemetery. Nobu took us behind the lantern hall to stand in front of the mausoleum. Here he told us the story of Kobo Daishi’s eternal meditation and chanted the Heart Sutra which was a beautiful end to the tour. The lantern hall was also where we were able to see the morning chanting. Ryochi had told us that it was OK to leave quietly part way through but we ended up sitting and listening to the whole of the one hour ceremony with four monks chanting and a head monk making ritualistic sounds with a drum and gong, it was a mesmerising and otherworldly experience. After the ceremony finished at 7am we wandered the almost empty cemetery. 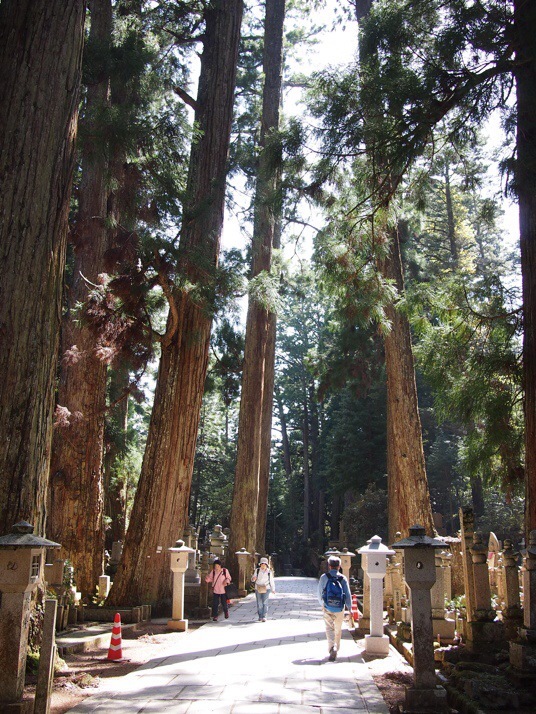 The path through the cemetery is lined with huge Japanese cedar trees. Their average age is 200-600 years, but some are as old as 1000 years. 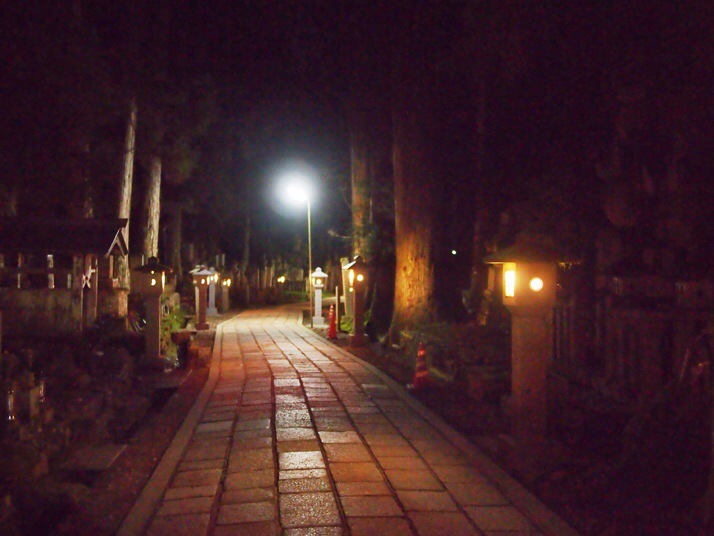 As you might expect with a cemetery, there are a few superstitious stories connected with Okunoin. There is a well in the centre where it’s said if you can’t see your reflection in the water you’ll die within three years (I’m pleased to report that we were both able to see our reflections), a gravestone which if you put your ear against it you can hear the cries in hell (fortunately that one didn’t work…) and a stone which pilgrims try to lift onto a shelf – the heavier the stone the more sins you have (we couldn’t try it as the building containing it was boarded up). The Danjo Garan complex is the site of the first monastic constructions here in the early 9th century although no original buildings remain (building your temples from wood and thatch leads to a high probability of destruction by fire). Along with Okunoin it is one of the most important places in Koyasan. There’s no entry fee to just wander around (you only need to pay to enter the buildings which are open to the public) and it was a good place to see the traditional wooden architecture and thatched roofs up close. 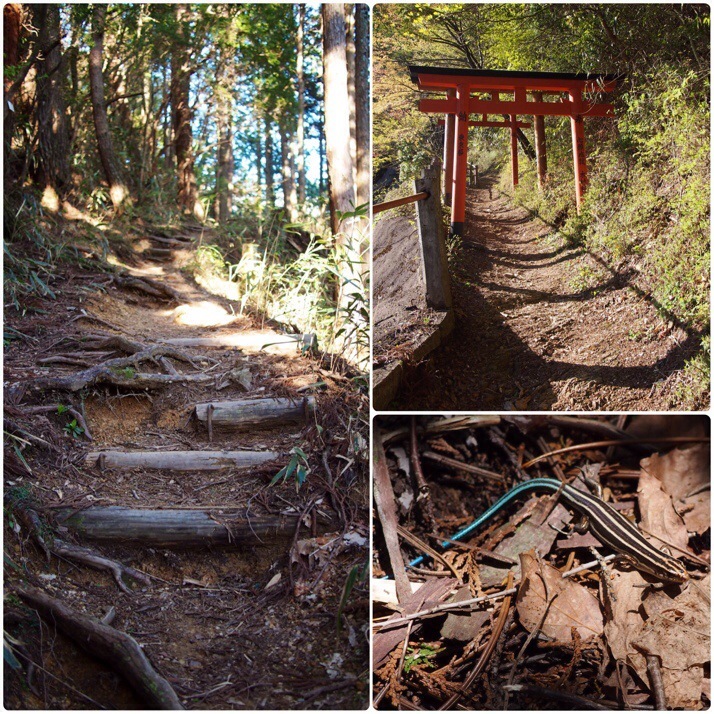 Until the late 19th century women were not allowed to enter the town area of Koyasan and so female pilgrims followed a trail circumnavigating the town with dedicated women’s temples on each of the access roads. Nowadays the trail is set up for hikers and it’s a nice way to get a different perspective on the town as well as some spectacular views if you’re lucky enough to get clear weather as we were. The total length of the path is 15.5km but it’s possible to break it down into smaller sections. 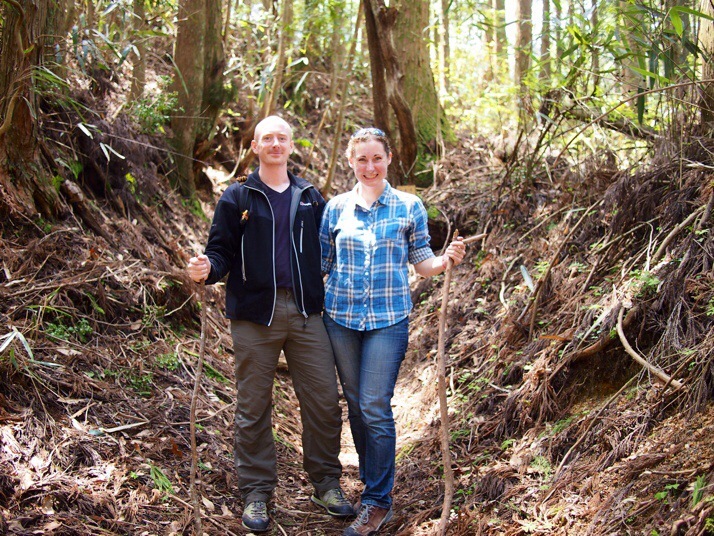 On our first afternoon we climbed from the Daimon (Great Gate) up between torii gates to the summit of Mt Betendake. It was quite steep and in places the steps were very uneven but we got spectacular views across to the Inland Sea (about 20km away we think) and it was nice to be up above and out of the bustle of the town for a while. 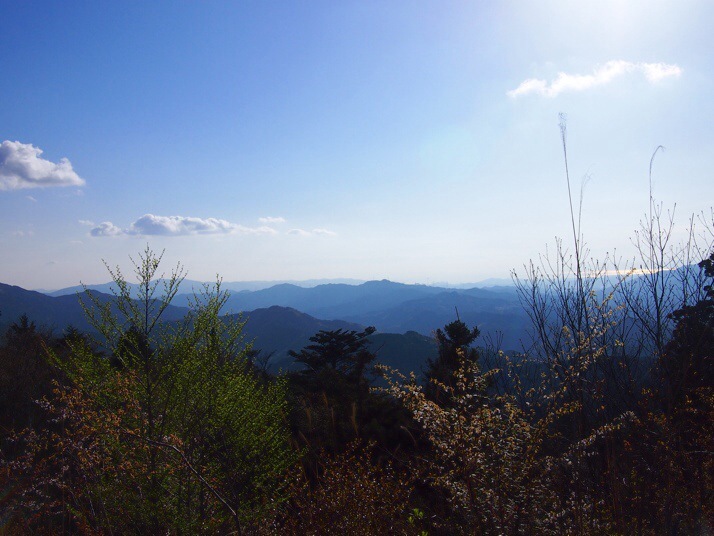 The following day we decided to tackle the southern portion of the women’s pilgrimage route about 5km, or just over 3 miles, from the guesthouse to the opposite end of town, ending by the Daimon. Again, we met very few other walkers so most of the time it was just us and the rustling of skinks (small lizards) in the dry leaves with occasional glimpses across the valleys and mountains. Koyasan was an excellent stop on our itinerary. I’m sure that a stay in one of the temples would be very rewarding but we didn’t feel that we’d missed out on anything by staying in cheaper accommodation, we just wish that we’d booked two nights instead of one! 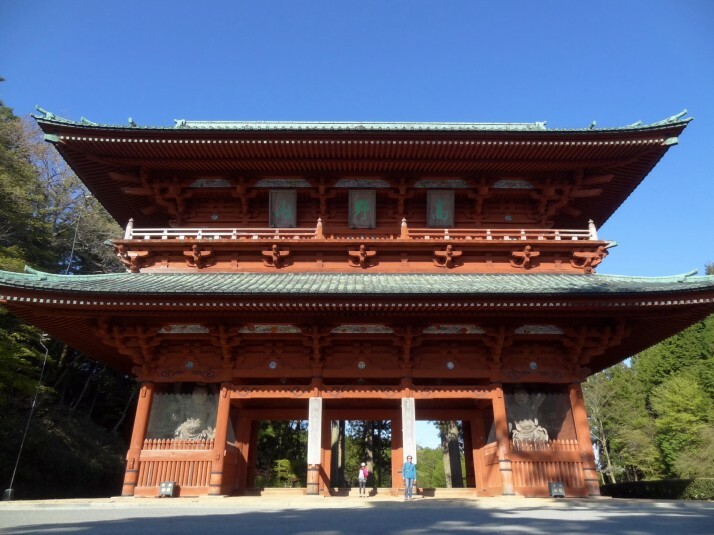 This entry was posted in Places and tagged Japan, Koyasan, temple on June 6, 2014 by Julie. I love the Mobius strip grave – that’s brilliant. Looks lovely. You packed a lot into a short time there! 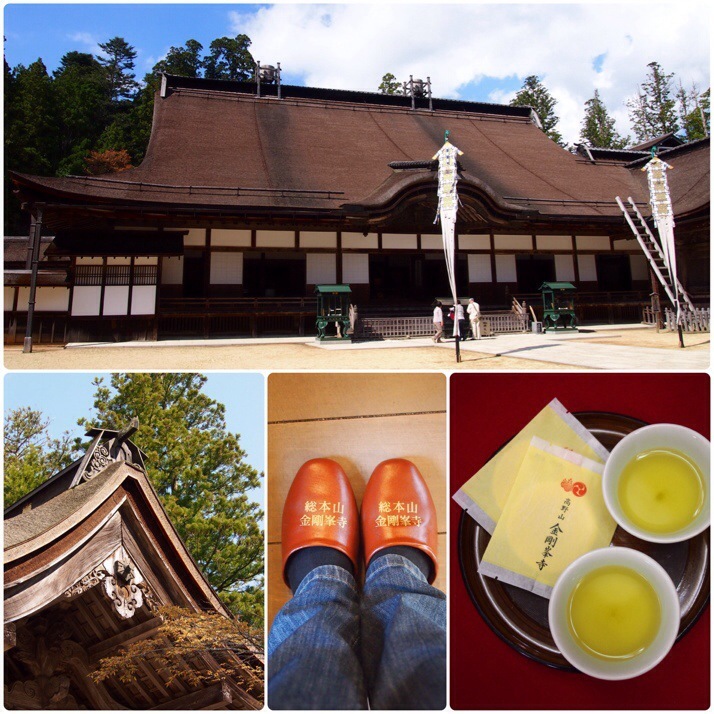 We are so happy that you enjoyed staying in Koyasan!!! Hi Ryochi! Thank you for making our stay in Koyasan so enjoyable!